For a project I am working on, I needed to figure out which elecion districts make up a New York City Council District. While this would be a simple lookup to conduct for one district, it would be very time consuming to do for all fifty one districts in New York City. Fortunately, the wonderful QGIS comes with a built-in Python console that makes solving these sorts of problems much more managable. The method that I used involved working directly with the QGIS console. There is a way to access the associated QGIS library without using QGIS explicitly, but I wanted to be able to check on things as they progressed visually, so my approach involved using QGIS directly. Note also that I’m using QGIS version 2.2 Valmiera (which has a much improved Python console from 1.8 Lisboa, along with a revamped API). This gives an iterator object. At this point, getting the geographic intersection is pretty simple. That approach, though, can be really slow if you have lots of feature elements to iterate through. This can be sped up significantly by using a spatial index. For details about the timing of the speed increase, check out this blog post by Nathan Woodrow. Now, we search for the intersection based on the index. This will return the same results, but will be much faster. Now that we’ve added the new field, we have to add the data to it. This is also fairly straightforward. 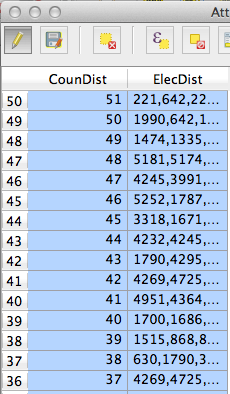 Now, after we run this script from the console, we should see the list of districts populated in the proper field. The full code that I ending up using is available at this gist.